En este trabajo estamos interesados en el estudio de la temperatura y el perfil de las colas supratermales de los electrones en nubes magnéticas. Para ello hemos modelado las funciones de distribución de velocidades de los electrones como superposición de dos poblaciones, core (Maxwellian) y halo (Tsallis o tipo kappa). Hemos analizado los valores del parámetro kappa que caracteriza las colas supratermales de la componente halo dentro y fuera de la nube magnética. Hemos encontrado, en base a los eventos estudiados aquí, que no hay diferencias significativas en los valores del parámetro kappa, dentro y fuera de las nubes magnéticas. Palabras clave: Electrones, función de distribución de velocidad tipokappa, nube magnética. This work presents a study of the electron suprathermal tails profile and its temperature inside of the magnetic clouds. We have modeled the electron velocity distribution function as a superposition of two populations: core (Maxwellian) and halo (Tsallis or kappalike). The kappa parameter value, which characterizes the suprathermal tail of the electron halo component has been estimated. We have found, based upon the events studied here, that there are no significant differences in the values of the kappa parameter, inside and outside magnetic clouds. Key words: Electrons, Kappalike velocity distribution function, megnatic cloud. A subset of Interplanetary Coronal Mass Ejections (ICME) is characterized as Magnetic Clouds (MC). The features of the magnetic field topology of these events have been largely discussed in the scientific literature (NievesChinchilla et al., 2005; Lepping et al., 2006), and references therein. 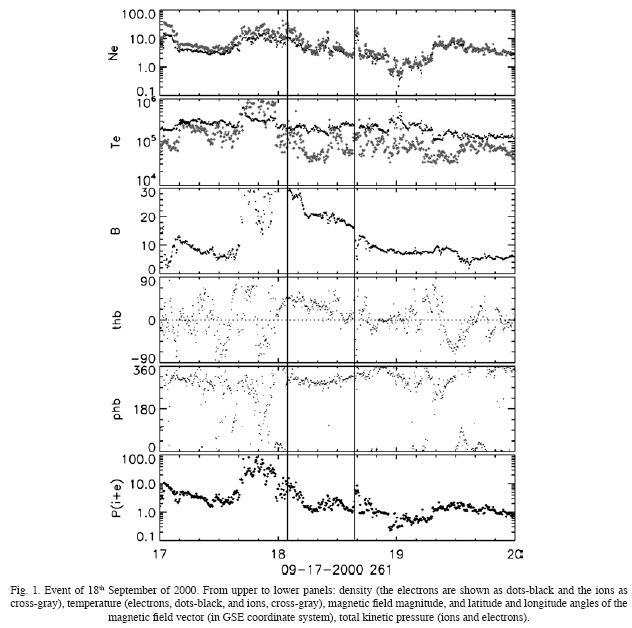 However, it is important to identify the signatures in the solar wind protons and electrons that characterize these events and their boundaries, in order to establish a connection between these particles and solar events as suggested by Russell and Shine (2005) and references therein. Fainberg et al. (1996) showed that the nonthermal electrons can contribute as much as 50% of the total electron pressure within magnetic clouds and suggested that the electrons are non Maxwellian. We model the nonthermal distribution effects by a Tsallis kappalike (i.e. power of κ) distribution, which has been obtained from nonextensive statistical mechanics Tsallis (1988) and we have analyzed the k parameter value for every electron VDF (Velocity Distribution Function) measured inside and outside magnetic clouds. The model has been developed deeply in NievesChinchilla and Viñas (2008). The parameter κ dictates the degree of nonthermal effects since small values provide a measure of suprathermal tails, whereas for κ ∞ the VDF will approach a Maxwellian distribution. For this work we have selected three events: 18th September, 2000; 6th November, 2000; and, the double structure of 19th October, 2001. These events have been identified and analyzed by different authors (Russell and Shine, 2005; NievesChinchilla et al., 2005; Lepping et al., 2006) and their kinetics properties have been studied in NievesChinchilla and Viñas (2008). In fig. 1 we show the magnetic field and the bulk plasma parameters of one of the magnetic clouds. According to Dasso et al. (2001) electrons have generally a higher temperature Te >> Tp than protons during the time interval of the magnetic cloud. We use the reduced VDF's measurements and we impose the total density (n = nc + nh) and the zeroth parallel current (nc δUc + nh δUh = 0) conditions. The procedure used was to obtain good initial guesses for the fit parameters of the Maxwellian core and the halo kappalike from the data to initiate the iterative fitting scheme until convergence was obtained. This procedure was carried out for each measured WIND/SWEVEIS reduced distribution, which corresponds to about 6,500 measured VDF's per day. About 10% of the fitted results have been discarded because of no convergence, too many iterations required or because their Ï2values were too large. Some of the data were also discarded when the magnetic field elevation (inclination) angle was greater than ±54°, which is beyond the viewing angles of the VEIS detector and therefore the parallel information to reduce the distribution function is underestimated. More details of the fitting procedure and the quality of the analysis are also presented in NievesChinchilla and Viñas (2008). We have done the analysis on three magnetic clouds that have been identified by different authors (Russell and Shinde, 2005; NievesChinchilla et al., 2005; Lepping et al., 2006). The histogram of the distribution of κ parameter values (obtained from every fitting of the model to the data) for each event is shown in fig. 2 (inside) and fig. 3 (outside). 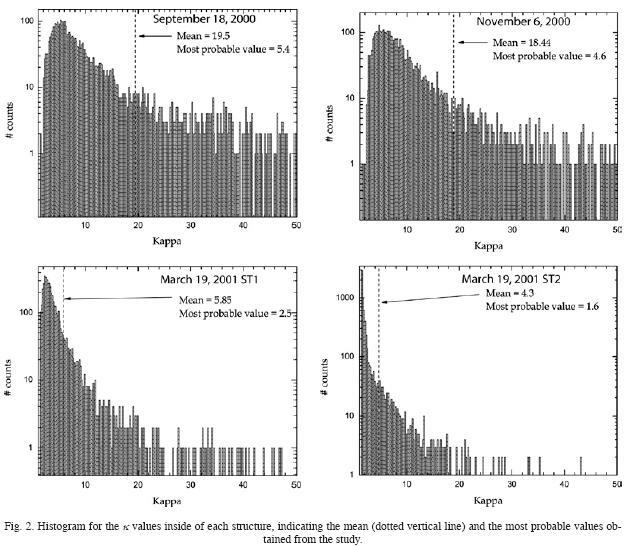 A comparison of the mean and the most probable kappa value inside and outside, for the cases of September 18, 2000 and the second structure of March 19, 2001, don't show significant differences. However, the values of the mean and the most probable value for the event of November 6, 2000 and the first structure of March 19, 2001 are greater inside than outside. Although the topic in this work is to analyze the kappa parameter value inside and outside the magnetic cloud (κ = 1/(q  1), and q indicate the degree of nonextensive of the electron VDF), in the table 1 and 2, we show the mean values of other parameters obtained of the fitting procedure and related with the core and halo populations. We have investigated the electron VDF's for three magnetic cloud events in the solar wind using the plasma and magnetic field observation of the WIND spacecraft. The model used to describe the electron VDF is based in a superposition of two populations: a core Maxwellian and a halo kappalike distribution. The kappa parameter value that characterizes the profile of the suprathermal electron component has been estimated inside and outside of the magnetic cloud. Our results suggest, Table 1 and 2, that the halo component of the electron VDF mainly dominates the thermodynamical moment temperature of the MC. Our main result indicates that although the electron halo component dominates the electron temperature, the kappa parameter which characterizes such component is not sensitive enough to provide a significant signature between the electrons inside and outside the magnetic clouds, fig. 2 and 3. However, this result requires further analysis using a larger ensemble of events in order to resolve more exhaustively the statistical differences inside and outside of magnetic clouds or analyze the MC boundaries.